Straight Cut Primary Gear Sets Available to order now are these replacement straight cut primary drive gears, A Replacement for the standard helical cut gears, This lets the horses loose!! These offer more power output over the standard helical gears by reducing friction, and side loading on the thrust washers A revised gear ratio has been implemented on these gear sets- stock ratio is 26/58 = 2.230, these gearsets are using 27/59 = 2.185 which increases the clutch torque capacity by 2.1% and allows a steeper swingarm angle to be used. Outside party tests have shown an increase of around 6bhp on a 100bhp engine by fitting straight cut primary gears. 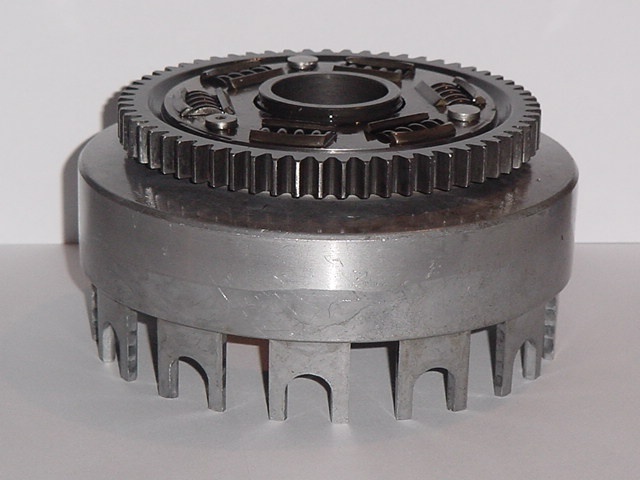 This gear set retains the use of the clutch basket 'Cush Drive'. So why not replace your power robbing, clutch destroying Helical Cut primary gears?